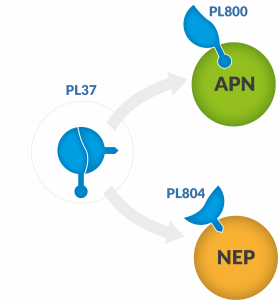 PL37 is a Dual ENKephalinase Inhibitor (DENKI), a small molecule with two active metabolites (PL800 & PL804), which acts by inhibiting the enkephalin-degrading enzymes APN (aminopeptidase N) and NEP (neprilysin) respectively, thereby increasing the local concentration of enkephalins triggering a local and sustainable pain relief. PL37 has completed an oral phase IIa study evaluating the safety, tolerability and efficacy of 200 mg t.i.d. of PL37 in patients with peripheral neuropathic pain of diabetic origin unsatisfactorily treated with either pregabalin or gabapentin. An analysis of the pregabalin subgroup showed that PL37 met the study’s primary endpoint in this patient population with a clear difference of 1.21 between PL37 and placebo. The pain scores of patients treated with PL37 kept improving throughout the study while the safety and tolerability of PL37 was good. PL37 pharmacokinetics has shown that its target enzyme inhibition is effective and short lived, making it an ideal development candidate for intravenous or acute oral administration. Pharmaleads intends to pursue the development of PL37 in a Phase I study as a potential replacement for injectable morphine in surgical, post traumatic pain. The trial is expected to begin in 2020. Current treatments include injectable and oral opioids which have significant side effects such as respiratory depression, constipation, nausea and sedation as well as dependence and tolerance issues. The current global injectable opioids market is estimated to be worth $ 6 billion.